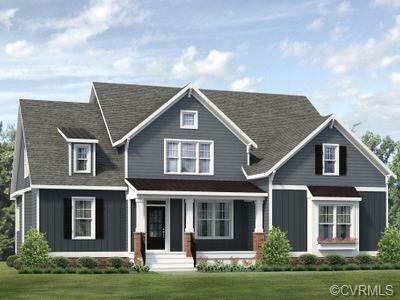 Introducing the Augusta by Main Street Homes in beautiful Harpers Mill! This stunning Energy Star certified two-story home offers 9-foot ceilings on the first floor, open floor plan, four bedrooms, three bathrooms, and two-car garage. This versatile plan incorporates a dining room/study off the foyer that leads to a spacious gourmet kitchen with quartz countertops, a wall oven/microwave and large island opening to a kitchen nook and 2-story great room with a gas fireplace. Located off of the garage are a built-in mudroom drop zone, a spacious laundry room, bathroom, and a guest bedroom or flex room. The first floor private master suite is located off of the great room and offers a large walk-in closet and an en suite that includes a double vanity, garden tub, and shower with bench. There are beautiful hardwood stairs leading to the second floor. The second floor has two bedrooms, a bathroom, and expansive loft. This home also features a beautiful rustic screen porch and deck to enjoy outdoor entertaining.